Your Corner Store Now Carries Fresh Produce! The Wellness Coalition partnered with the Central Alabama Regional Planning and Development Commission to increase the number of convenience stores that provide healthier food options including fresh fruits and vegetables. Check below for a directory of healthy convenience stores you visit. Make sure to pick up fresh fruits and vegetables the next time you’re there! 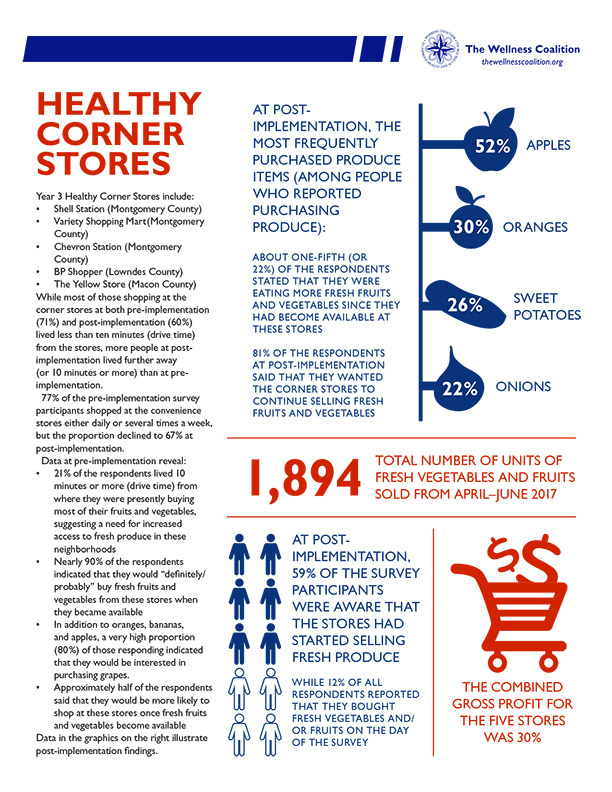 See the results from our latest Healthy Corner Store survey. Kwik Stop (Petro Plus) Accepts EBT! Shopper Stop #211 (BP) Accepts EBT! The Yellow Store Accepts EBT! Holt Street Grocery Accepts EBT! Kwik Shop #107 Accepts EBT! Kwik Shop #124 Accepts EBT! Value Food & Gas Accepts EBT! Variety Shopping Mart Accepts EBT!